Sheffield is being strengthened in a way that is ‘more than just positive’ through a partnership between the council and property firms, a round table event hosted by The Star heard – as big developments and impressive deals point to a city ‘on fire’ with greater investment. Chaired by the newspaper’s editor Nancy Fielder, the in-depth discussion brought together members of the Sheffield Property Association – an organisation formed in 2016 to be a ‘collective voice’ that was the first of its kind outside London – with the council’s chief executive John Mothersole and its cabinet member for business Mazher Iqbal. SPA representatives involved were Alexis Krachai, managing director of communications company Counter Context and his colleague, account manager Lucy Brown; Tim Bottrill, founder of the Colloco agency; Jamie Wilson, director at HLM Architects and Jim Bell, a director at engineers Arup. The relationship between the association and the council’s new city growth department, set up earlier this year following a months-long reorganisation, is probably unique for ‘a whole set of reasons’, Alexis said. Online fashion retailer PrettyLittleThing, owned by Boohoo, is taking one of the biggest warehouses in the country, on Shepcote Lane, Tinsley, with the promise of 1,200 jobs. John said it was a case study in how Sheffield should be talking to investors earlier. The panel was asked to explain why Sheffield had a presence at occasions such as MIPIM – a prominent real estate conference in Cannes – or bidded on landing names like Channel 4. Mazher reeled off a list of successful schemes including the 437-bed Brass Founders student flats on Scotland Street and the Chinese-backed £65m New Era development of shops, apartments and offices off Bramall Lane. In addition, banking giant HSBC is moving its Sheffield staff to offices in phase one of the Heart of the City II project in Charter Square. “I think the city is on fire and there’s much more investment,” he said. 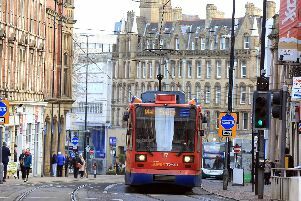 The council is driving Heart of the City II, the £500m mixed-use project to overhaul the middle of Sheffield. It is the successor to Sevenstone, the ‘new retail quarter’ that stalled when the recession hit and was then dropped when the council parted ways with developer Hammerson. Sheffield needs leadership from philanthropic businesspeople of a kind that harks back to the days of the revered J.G. Graves, the debate was told, if cuts are to be overcome. Graves was a mail order entrepreneur who donated towards the opening of art galleries and gifted land, including Ecclesall Woods and Concord Park, before his death in 1945. Alexis Krachai said the Sheffield Property Association had talked about the idea ‘from day one’. Alexis described how firms would need to take on responsibilities and put ‘individual commercial priorities to one side, contributing to a whole’.